If Provincetown is too busy for you, but Truro is too quiet, then Wellfleet Massachusetts may be just right. Located near the tip of Cape Cod just below Provincetown and Truro, Wellfleet is the perfect blend of New England charm and stunning natural beauty. Like its neighbors, a large percentage of the town (over 60%) is protected as part of the Cape Cod National Seashore, with additional areas preserved by the Wellfleet Bay Wildlife Sanctuary. Wellfleet’s preserved land is not only home to miles of pristine beaches on both the Atlantic Ocean and Cape Cod Bay, but also to numerous spring-fed kettle ponds popular for swimming, canoeing, and kayaking. There are also miles of hiking and biking trails through sand dunes, salt meadows, and pine forests. Yet Wellfleet is best known for its oysters (the annual Wellfleet Oyster Festival is held every October), and there are many restaurants, taverns, bistros, and seafood shacks in town for sampling the local shellfish. The town’s central village is home to many of these eateries, as well as a multitude art galleries and boutiques, all within walking distance of each other. Although you will not find nightlife in Wellfleet to match that of Provincetown, there is still plenty to do, including Wellfleet Harbor Actors Theater, Wellfleet Cinema’s drive-in movie theater and mini-golf, square dancing on the town pier, and a summer concert series at Baker’s Field Tent. 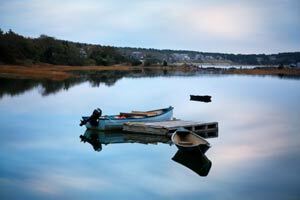 Wellfleet is a choice destination for a family vacation on the Outer Cape.